Coupons.com Unveils America’s 25 Most Frugal Cities - Quotient Technology Inc.
MOUNTAIN VIEW, Calif. March 22, 2018 – With ample evidence that saving money makes people happier, it’s perhaps little surprise that the honor of most frugal city for 2017 goes to the place where the political fighting never stops: Washington, D.C.
For the second year in a row, the Nation’s Capital has earned the top position on the annual ranking of America’s Most Frugal Cities, according to the Coupons.com Savings Index. The seventh annual ranking was released today by Quotient Technology Inc. (NYSE: QUOT), which runs the popular app and website, Coupons.com. Maybe the political landscape sent people seeking solace in savings. Or perhaps the Capital saw an influx of savvy shoppers with the change of administrations. Whatever the reason, shoppers in the D.C. area selected more than 27 million digital coupons in 2017, totaling more than $39 million in savings – a 25% increase over 2016. All told, Quotient delivered more than 3.5 billion digital coupons in 2017, the equivalent of 6,747 every minute. As you can see, plenty of shoppers across the country were smart about saving money in 2017, even as their cities moved around in the ranking. In 2017, one city, Virginia Beach, VA, fell off the top 10 list completely, slipping from No. 9 in 2016 to No. 13 in 2017. This year’s other top 25 frugal cities include: Boston, MA (#11); Miami/Fort Lauderdale, FL (#12); Virginia Beach, VA (#13); San Francisco, CA (#14); New York, NY (#15); Phoenix, AZ (#16); Indianapolis, IN (#17); Kansas City, MO (#18); Houston, TX (#19) Columbus, OH (#20); Las Vegas, NV (#21) Providence, RI (#22); St. Louis, MO (#23); Cincinnati, OH (#24); Pittsburgh, PA (#25). For a complete list or for more information about the Coupons.com Savings Index, please email press@quotient.com, or to start saving, visit http://www.coupons.com. 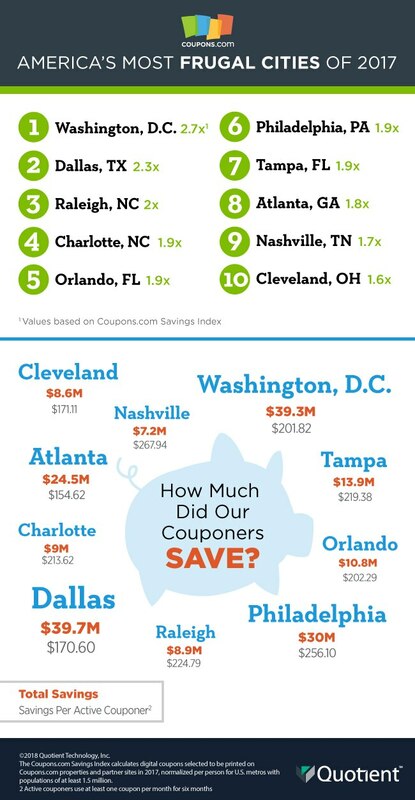 The Coupons.com Savings Index calculates digital coupons selected to be printed on Coupons.com properties and partner sites in 2017, normalized per person for U.S. metros with populations of at least 1.5 million.